Fitzroy is a dynamic little neighborhood just north of Melbourne’s city center. The narrow streets and pedestrian laneways buzz with shops and cafes that show off its rich immigrant history. As one of the city’s most up-and-coming areas, Fitzroy is an expensive place to live. Ironically it’s also a cultural hub for the state of Victoria’s indigenous population. Over the last few decades, Australia’s much-oppressed native people gathered in Fitzroy because they knew they’d find a support system there. Activists fought for peace and for war, family members reunited in the parks and meeting houses, and Aboriginal leaders built up a safety net for the community as best they could under the circumstances. As a result, many indigenous people continue to live in or frequent Fitzroy today. 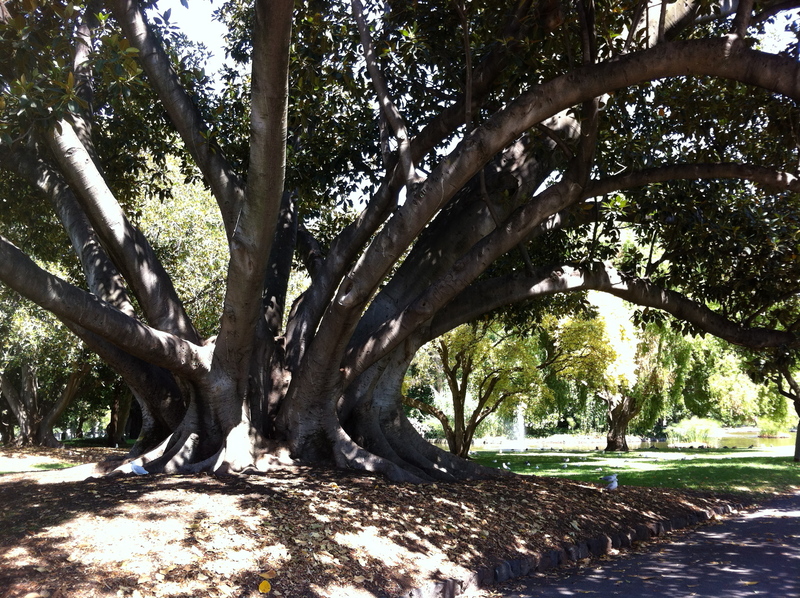 Besides serving as a canopy for the gorgeous Carlton Gardens, this tree doubled as a meeting place for indigenous Australians and was a common location for aboriginal speakers to address large crowds in the 1920s-1940s. This organization was founded in 1973 after members of the community took a group of academics to a pub at closing time and showed them the tragically normal scene of Aboriginal people being arrested in the streets without cause. The group still exists in a different location. Meanwhile, a contemporary gallery specializing in indigenous art has opened where the old legal service office used to be. The gallery was an instant favorite of mine (more on it to come). 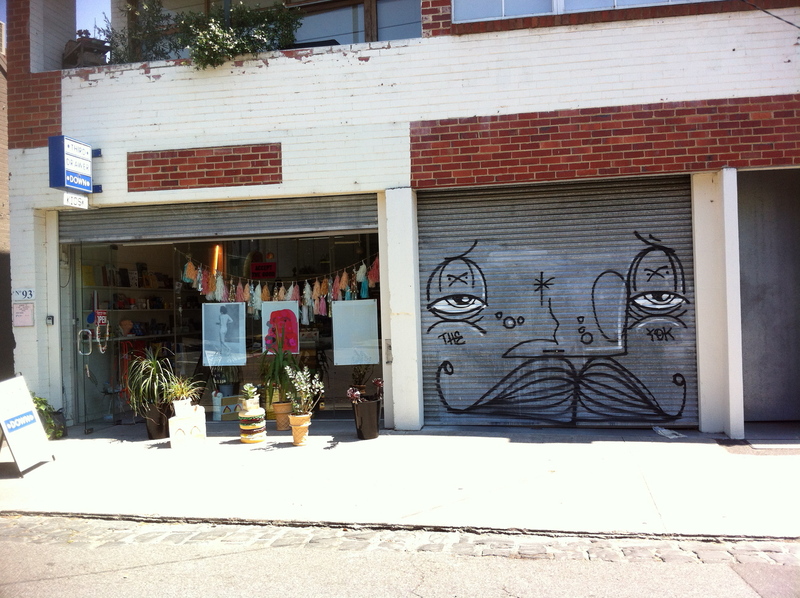 If you’re ever in Fitzroy, stop by whether or not you walk the trail. 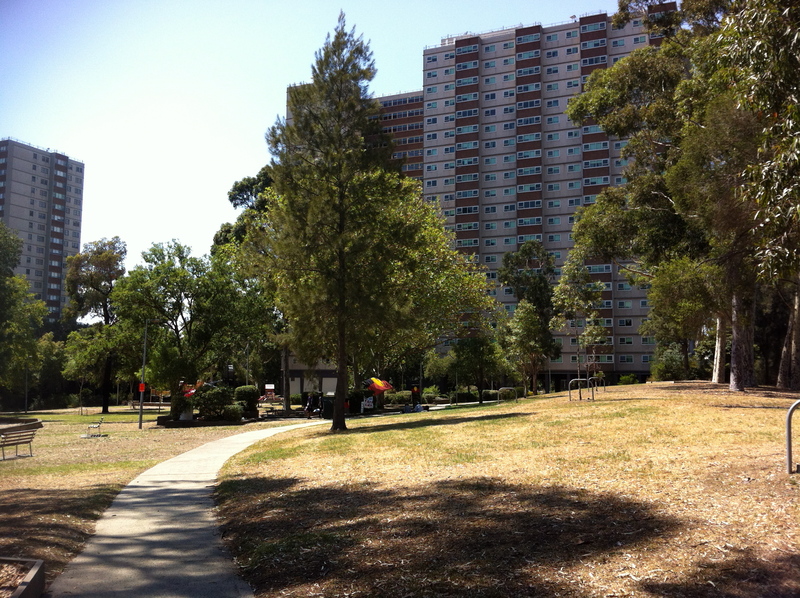 At first glance, the Atherton Gardens complex looks like any other public housing development, and in most ways it is. Currently it houses many refugees and other migrants, including a large Sudanese community. But the process of building the towers in the 1950s further displaced many indigenous families who had moved to Melbourne in desperation during the first half of the 20th century. 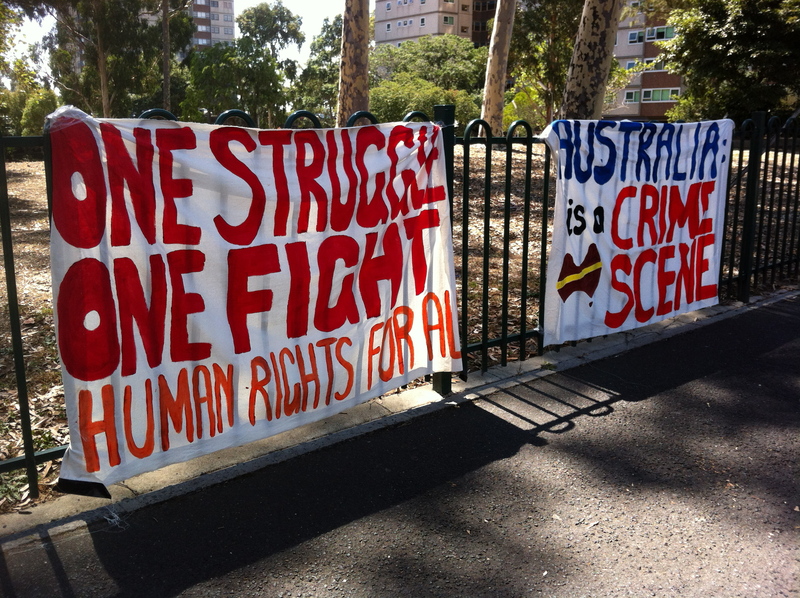 Its park became a gathering place for Aboriginal activists and homeless indigenous Melbournians, and remains so today. Vehement protest banners hang on the complex’s fence. Across the street, flyers line the windows of an Aboriginal community center and advocate a repossession of lost land and dignity – by whatever means necessary, according to some of the notices. Each stop along the tour has a plaque marking it as an historic location and explaining why it’s important. Many of the stops really need that, because since their days as Aboriginal heritage sites they’ve been replaced by cafes, hotels, and shops. In most cases, the original offices have relocated to better spaces. I haven’t been to a bad coffee shop here, and I’ve been in Melbourne for a month. So if you ever take this tour, stop at one of the heritage sites along the way and enjoy its new purpose while reflecting on its history. At the same time, if you’re anything like me you’ll also feel pain at seeing yet more notable indigenous places marked for demolition as new highrises come barreling in to take their place. It’s a complex walk – not physically but emotionally. If you want easy, there’s a pretty path by the river. It’s not all a downer, though. As you meander the laneways you’ll also find incredible street art, used bookstores, and many hidden places that have built up and supported indigenous communities for decades. You’ll see the prettiest homeless shelter you’ve ever laid eyes on, stroll up grungy Smith Street with the hipsters, and likely pass by Aboriginal elders as they sit outside exchanging stories or checking up on the neediest members of their community. 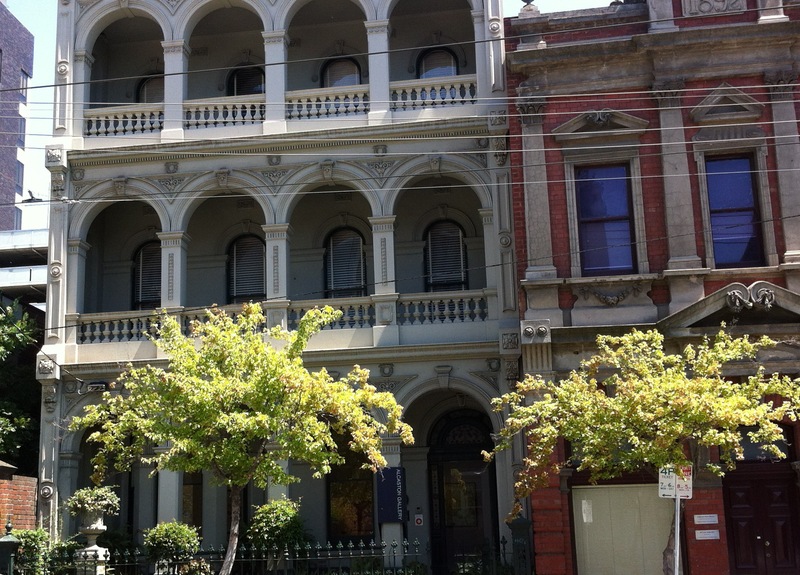 Fitzroy is ancient while modern, cracking while polished – a beautifully inconsistent place. Take the tour yourself if you’re ever in the area, and see if you agree.